Coming Continuing Comics 3: A crossover, rebirth and jumping on point, all in one! The April Previews does not show a lot of big debuts in the month of June. Or at least, not a lot of debuts I care a lick about anyway. Yet I still have a few picks worth taking a look at. But first I wanted to give an honorable mention to Usagi Yojimbo. The book is coming back from IDW now with a new first issue (which makes this Usagi volume 4 I believe.) There's little to nothing super powered fiction about the character outside crossovers with the TMNT, but he's well worth a mention as the title is consistently one of the best comics on the market. Alright, on to our more superheroic fare, none of which comes from either of the big two this month! It's about as far away from a number one as you can get, but Erik Larsen has consistently produced one of the most impressive superhero universes ever now for twenty-five plus years. I'm behind on the series by nearly a year right now, but this issue offers a "perfect jumping on point" for readers as Malcolm Dragon fights the Demon King as the run up to the next anniversary starts. 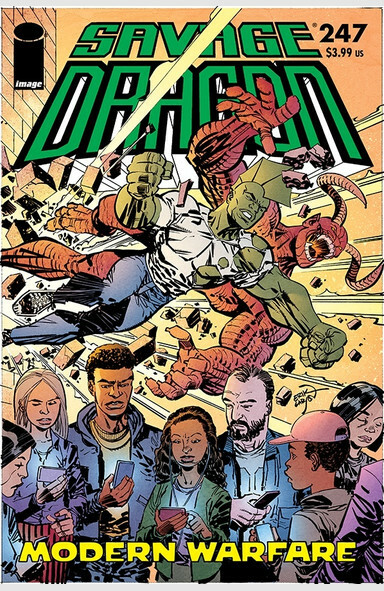 If you're an old school comic fan and not reading Savage Dragon, I encourage you to seek out what you're missing and be surprised by one of the most impressive superhero sagas of all time. Tim Seeley has come up with a winning formula for bringing back Cassie Hack and Vlad, the monster hunters of Hack Slash. He's just wrapping a crossover at Dynamite with the old Chaos Comics characters that embroils her in their entire new history at that publisher. As soon as that one wraps, it looks like she'll be right back into it, this time at IDW! The story is a pretty basic setup. A new Crow rises, but his revenge spree is taken by Cassie and Vlad as the rise of a new slasher, the supernatural horrors they hunt! It's a superb concept to run a story about. More impressively, Seeley returns to pencils on the book for the first time in years, while he's inked by regular Crow artist Jim Terry. This one promises to bring the fun and violence! Valiant has been dusting off old IPs with new versions for quite some time now, but they still haven't covered them all. The Psi-Lords are fondly remembered by anyone that read the book but this one doesn't look to have heavy ties to that concept. 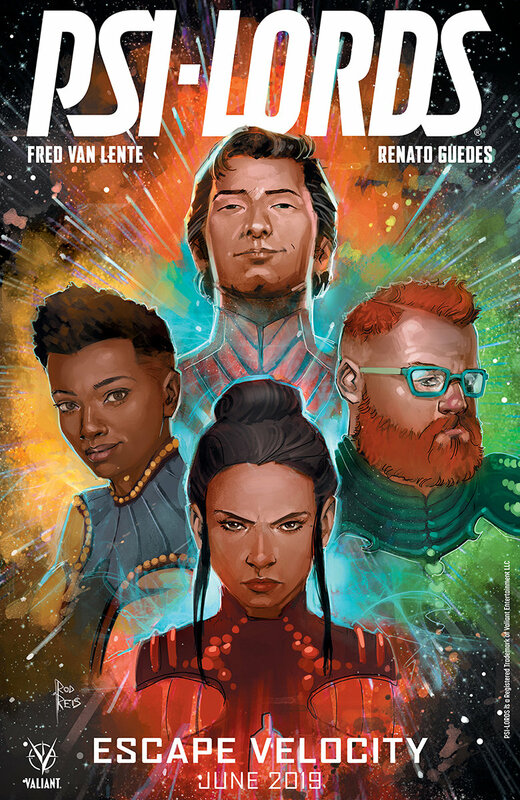 Still it looks like an intriguing book by artist Renato Guedes and the criminally under-rated Fred Van Lente. The book takes four humans and drops them with amnesia into the middle of an intergalactic hotspot. And while it spins off from events in the current X-O Manowar book, it is meant to stand on its own. With a star creative team, this looks like a great new ongoing series in a universe filled with intriguing moves in 2019. Do you have a new favorite coming soon to the comics world? Let me know in the comments below! Over the last few years, Mexican artist Rafael Gallur has become a go to painter for action. A regular painter of amazing lucha libre magazine covers, he channels the energy of Frazetta into modern cover art, something very lacking on this side of the border. And since his art doesn't quite fit into the usual comic-oriented Great Art feature, I thought it was time to give him his own feature here at Super Powered Fiction. Few painters can match the power he brings. Cibernetico isn't as recognizable a luchador as some. He has been maskless since early in his career and never quite received the attention in America that many Mexican talents have over the years. But Gallur brings him to life with a true flare here and even presents quite a looming threat in the robot monster behind him! 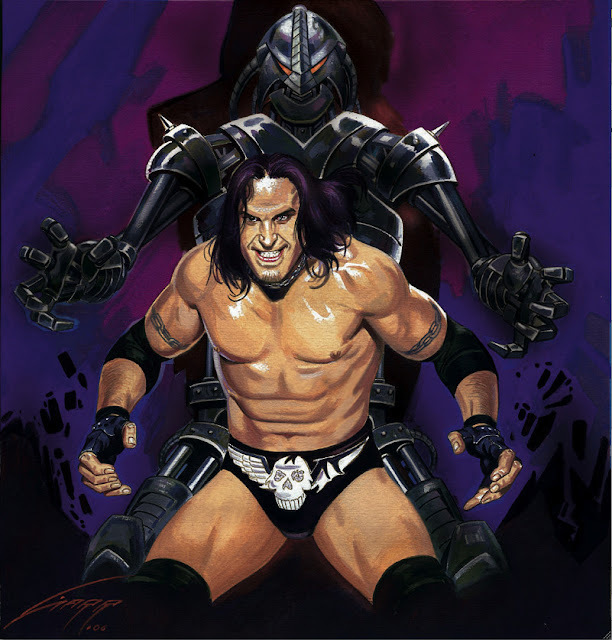 Be sure to head over to Gallur's DeviantArt to check out more work by him and order some of his amazing work as prints. After you're done admiring his work, don’t forget to check out some of the other great stuff from me this week! The Good Fight returns... to the past! 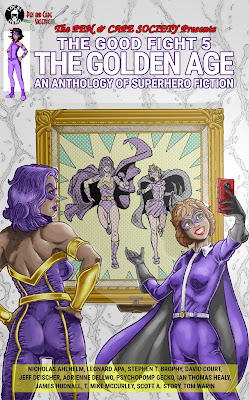 I've proudly been a member of the Pen and Cape Society for several years now as the group of superhero fiction writers have put together four great anthologies and worked together in all kinds of unique and fun ways. Now the fine folks at Local Hero Press have prepped the fifth edition of our shared anthology series The Good Fight and this one takes us back a few years. Previous themes have wrapped around villains, "the homefront" (supporting cast) and sidekicks. 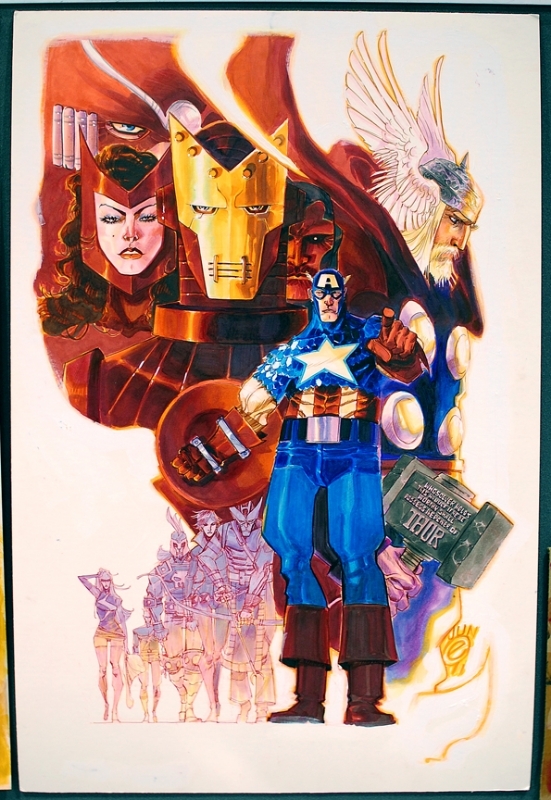 This time around, the series goes back a few years as the focus turns to "The Golden Age." Twelve writers answered the call for new stories of World War II superheroes, pulp age adventurers and everything in between. For those that have followed my previous The Good Fight contributions, you know that I like to make my focus a new tale in my "The Second Life of D.B. Cooper" series of short stories. How do I place a story about the later life of a 70s era plane hijackers into a thirties era setting? I will reveal that in a couple more weeks, but be reassured that the story's title does start with "The Second Life of." And I'm not alone. I have a mega-talented eleven other creators in this book with me: Leonard Apa, Stephen T. Brophy, David Court, Jeff Deischer, Adrienne Dellwo, Psychopomp Gecko, Ian Thomas Healy, James Hudnall, T. Mike McCurley, Scott A. Story, and Tom Warin! If you're interested in supporting great new fiction, be sure to head over to Amazon or Smashwords and pre-order your copy! The book launches on April 30! Today is April 1st and while many will celebrate the fools of the world, I will instead be turning my focus to the twice-annual Camp Nanowrimo event. Unlike the 50,000 word sprint that is the November event, Camp Nanowrimo is far more free form with open project types and goals. From there, I have more big plans for 2020. I'll write more about that soon though. 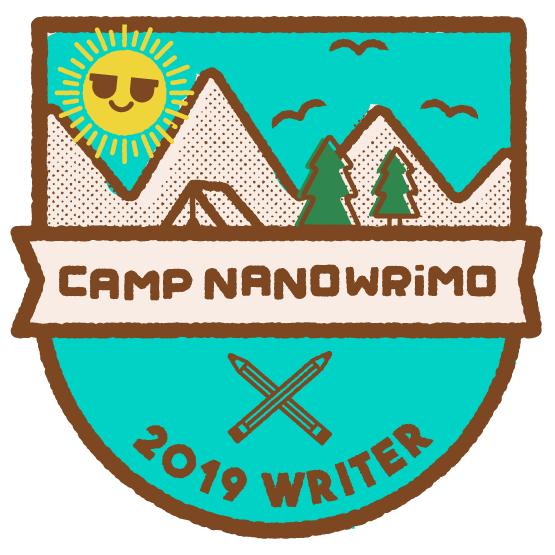 If anyone is interested in following along at Camp Nanowrimo, you can find my account here. 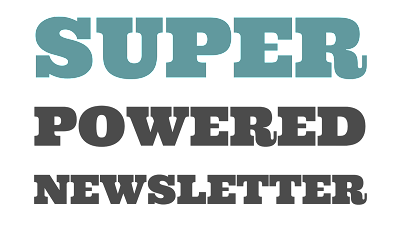 And if you're a fellow writer of the super or heroic that's also participating in the event, let me know and I'll add you to our shared cabin! The next month will feature weekly updates on the project as I work through first an editorial phase and then the completion of a year's worth of Quadrant tales. Those will hit every Wednesday, with other content already planned for Mondays and Fridays! So be sure to stay tuned into the blog as we get this show on the road!